To become a successful nation, India realizes that we have to emulate the Jewish quest for spiritual and worldly learning. We need a nation of empowered men and women, free and fearless to develop social, technological, entrepreneurial and humanitarian creativity, even while under constant attack. When we see the restoration of Jewish State and revival of Judaism in its ancient lands, we Hindus see ourselves. If Judaism is incomplete without the Jewish homeland, the essence of Hinduism is indivisible with the geography of India. Just as Jews were forced out and in exile for millennia, Hindus too suffered a millennium of Islamic and later European subjugation in their own homeland. Recent terrorist attacks in Brussels, Mumbai, Paris, Istanbul and Ankara are simply what Israel has been living with for decades -- and India, France, Belgium and Turkey do not have "settlements." The conflict is not about "settlements". It is about one group of people trying imposing its will, culture, religion and way of life on another group. With Israel, the "settlements" are only the pretext. If you look at any map of "Palestine," it has the exact outlines of Israel. For most Indians, it is hard not to feel a deep sense of historic gratitude towards Israel and the Jewish people. The State of Israel came to our military aid in just about every war India fought as an independent nation since 1947. Our elected leaders, in their vanity, polished their statesmanlike credentials denouncing Israel at every possible international gathering, even as they kept on turning to the Jewish State for help in times of dire need, whether civilian or military. From Golda Meir to Ariel Sharon, Israel never turned down any request. Getting nothing in return, the tiny and beleaguered nation paid a price for its support for India. At times, adversely affecting its relations with China or annoying its most vital ally, the United States, by extending support to a "socialist" country at the height of the Cold War. If there ever was a true sign of goodwill extended from one nation to another, Israel had shown it toward India and so many other nations, from Zaire to Haiti and elsewhere. Despite this, it took India more than four decades just to treat Israel as an equal partner on the world stage -- when India established full diplomatic relations with Israel in January 1991. India, however, had one redeeming quality. Although our political leaders hitched their wagon to the Soviet Union and the Pan-Arab nationalism in the early days of the Cold War, the Hindus of India, who constitute an 80% majority of the country's population, have been steadfast and consistent in their support for the State of Israel and the Jewish people. An international survey conducted by Israel's Ministry of Foreign Affairs in 2009 found Indians having the most favorable opinion of Israel, even ahead of U.S. respondents by a small margin. In August 2014, at the height of Gaza conflict, the city of Calcutta staged a 20,000-strong rally in support of the Jewish State, making it probably the largest pro-Israel rally that Asia ever witnessed. Finally, with the election of Prime Minister Narendra Modi in May 2014, the India's official policies have begun to reflect the desires and aspirations of the majority Hindu population of the nation. To become a successful nation, we realize that we have to emulate the Jewish quest for spiritual and worldly learning. We need a nation of empowered men and women, free and fearless to develop social, technological, entrepreneurial and humanitarian creativity, even while under constant attack. The homecoming of the Jews and restoration of the Jewish State in its historic land has been a source of great hope for us Hindus. When we see the restoration of Jewish State and revival of Judaism in its ancient land, we Hindus see ourselves. If Judaism is incomplete without the Jewish homeland, the essence of Hinduism is indivisible with the geography of India. Just as Jews were forced out and in exile for millennia, Hindus too suffered a millennium of Islamic and later European subjugation in their own homeland. After surviving the most vicious genocide in human history -- a brutal and systematic attempt by Nazi Germany to annihilate the entire Jewish population of Europe, claiming six million Jewish lives, the Jewish people worked to create a nation based on democracy, freedom, equality for people of all religions and ethnicities -- the only democracy in the Middle East. Today, over a million Arabs enjoy equal citizenship rights in Israel, and a level of religious liberty and rule of law never seen before in the Middle East. Arab Israelis are present in all walks of Israeli life; holding top positions in business, academia, media, government as well as military leadership. The tiny nation of Israel absorbed wave after wave of immigration, including a million Jews driven out of the Arab lands soon after the creation of Jewish State in 1948, Ethiopian Jews, and Russians escaping communism. Today, Israel is home to over 80,000 Jews of Indian origin. They have been fully integrated, and have excelled in all areas of society. They serve gallantly in the Israel Defense Force and bring glory to the country in sports. An IDF soldier of Indian origin, Barak Refael Degorker, was killed by Hamas during the Gaza conflict of 2014. Mumbai-born Sarah Avraham became Israel's 2012 women's Thai boxing champion. As the nation-states of Europe drive toward an impending disaster in failing to assert their spiritual and national identity in the face of the massive influx of Muslim migrants, only the example of Israel offers us hope. We must admit the failures, based on European liberalism, in our nation-building project. Western-style "affirmative-action" has failed to rid the country of caste-based discrimination, and all that the European style of hyper-sensitivity towards "Muslim sentiments" has done is stifle cultural freedoms in the country. India became the first nation to ban Salman Rushdie's novel The Satanic Verses, before even Iran, Saudi Arabia and other theocratic Islamic regimes announced their fatwas and bans. 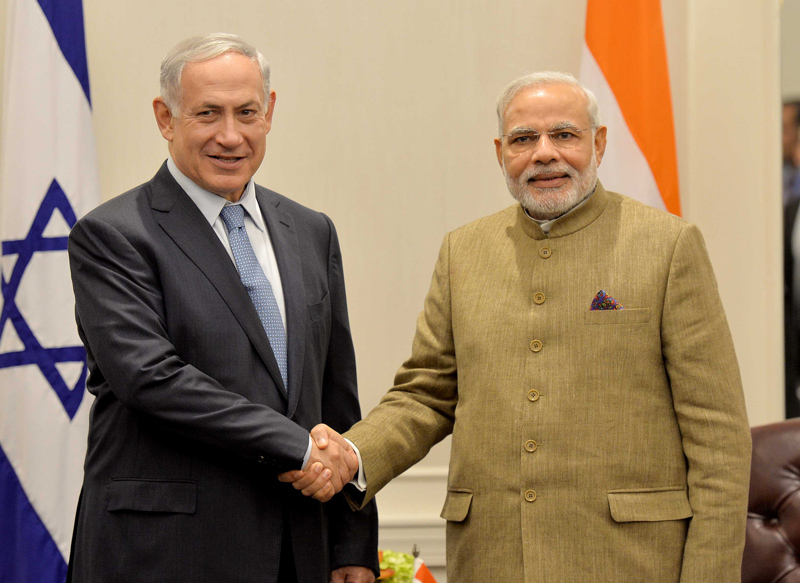 For decades, India shied away from technological and academic cooperation with Israel. India seemed to have been trying to act even more Arab than the Arabs themselves. Only an enlightened nation, built on a strong bedrock of Hindu unity, can ensure a secure and prosperous future for India. We cannot build a nation on foundations of an unjust and immoral caste system. Just as the resurgence of Judaism in its historic and ancestral homeland means no threat to the Muslim faith, Hindu resurgence and unity should cause no harm to religious minorities of other faiths. Countries that would like to succeed and thrive would do well to follow the example of Israel. The terrorism originating from neighboring Muslim lands must not only be countered militarily, but also with a renewed assertion of our on spiritual and national identity. Arabs and Muslims might surely realize that they themselves have been the biggest losers of the wars of fanaticism they have waged, and turn their attention to rebuilding their societies and facing the real issues of violence, bigotry, ignorance and poverty -- to name just a few. Until then, we all have a nation to build and a home to defend. It is beyond our scope, as Indians, to heal the pathologies of the Muslim world. We can only limit the damage by defending our home and securing our national borders. Until that day comes, we would all do well to stand with Israel. 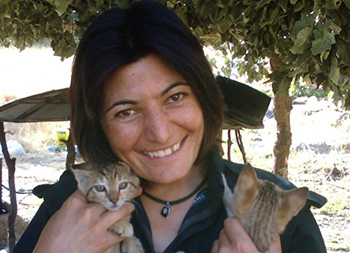 Vijeta Uniyal is an Indian current affairs analyst based in Europe. Thank you for your support. It's nice to know that someone out there cares. And besides I think you are right in your way of thinking...especially in this time of world uncertainty. This very well thought out article by Viraj Pradhan highlights Israel's historic decision to move politically and economically closer to nations in the Far East. There is grave doubt whether Europe will be able to survive the Muslim invasion that is now occurring there and will most probably soon occur in other Western countries. At the very least, economic productivity and viability in the West will suffer in proportion to the unregulated invasion of 'refugees' from Muslim countries. It is very possible that European culture will not survive at all and will be overtaken by proponents of Sharia Law. It is also quite possible that even with the election of Donald Trump to the office of POTUS, the potential for violence and civil division in the US will not subside. There is also the extremely important fact of the outstanding debt of trillions of dollars that will not be easy or even possible to erase or control. Thus, Israel's turning to the East and especially India is based in reality and pragmatism and to that extent we can all learn from them. One of the odd aspects of modern science as distinct from engineering is that it goes back to the monotheistic idea of one God and one natural law everywhere in time and place. All the ancients - deferring to local gods - were good at engineering but failed to erect on their practical skills the ability to abstract principles and use those to project further discovery and invention. That comes out of the West from the 16th century onwards following Galileo. It also starts at a peculiar moment when the ideological unity of the Catholic Church breaks apart in the Protestant Reformation and about the same time in the Moslem World faith and Sharia are elevated over enquiry and new technology. I do not know even a little about Hinduism but if within its ideology it accepts the notion of progress - cyclical or otherwise - rather than the Moslem ambition to freeze in theological perfection, then India will find its way forward. For the moment the Moslem World as the Salafi title indicates is looking back so even if it were to conquer it would freeze all progress, regardless of algebra and astrolabes. Mr. Unyal has expressed true feelings of us Hindus towards Israel & Jews. Thank you, Mr Unyal & Gatestone Institute. What a refreshing article, thank you for speaking the truth, this turmoil is and never has been anything to do with so-called "settlements"
Absolutely correct. The trouble with Islam, one of the problems with Islam, is that it is not so much concerned with the here and now but creating the conditions and bringing about the "end of the age" and the final judgement. The stronger and more influence Islam wields in the world the harder it will work to bring that goal about. Islam is not susceptible to normal rational concerns about humanity in the Earthly realm. Thanks Vijeta for writing such a true, heart felt article about my Jewish homeland. You hit on all the important points. Each time radical Muslims strike terror into a Western country be it in Europe or the US, some of us secretly are in a way glad. We say 'maybe now the rest of the world will see what Israel must deal with every day'. But I've learned that people only see what they want. Even as I write this, the EU continues to attack Israel and view it as an aggressive, apartheid state when the facts show quite the opposite. Even while the EU itself (Brussels) is under tremendous attacks by radical Muslims, a term they try their best not to use, they continue to condemn the tiny Jewish state. Instead of dealing with the biggest problem in the world, jihad by immigration, they are busy implementing labeling laws for goods produced in Judea and Samaria (West Bank) for Israel to follow. India could learn plenty from Israel. But Israel could also learn from India. They both know that they share a common enemy. Islam. They need to learn that they can count on no one to protect them and in the end they must always do whats in their best interests and learn that appeasement doesn't work. I look forward to a long mutually benefiting relationship between Israel and India! Shalom! Well said, Mr. Uniyal! Thank you! Namaste Vijeta. You have succeeded in demonstrating that Israel is a light unto nations. As history has shown, "those who bless Israel will be blessed, and those who curse Israel will be cursed." It is not India's, nor Europe's and USA's responsibility to heal the pathologies of the Muslim world. Mr. Uniyal uncovers the real Islamic motivation for its never-ending jihad. Despite the sizes of both India and Israel, it's not territory that's the center of Islam's unrelenting scheming and oppression, in this case to Judaism or Hinduism. What drives Islam's murderous will is the presence of any other religion, any of which Islam regards as a mortal enemy requiring conversion at the point of a sword, death if conversion is refused, or in milder Muslim lands subjugation of non-Muslims as second-class citizens who will pay special taxes that Muslims needn't pay. The issue of Israel's existence is not the bit of land of its state, it is the fact that Jews have made a thriving little democracy in a sea of Muslims. And, those Muslims who live in Israel with full rights aren't about to trade their places in Israel in order to live in Islamic-controlled countries. What motivation drives Islamic nations in close proximity to Israel, if it's not jealousy of Israel's progress? On one hand there is the State of Israel and its highly technical achievements, while its Arab neighbors look with jealous envy, but haven't produced as much as an improved clothes-pin for this world. Very comprehensive article in that it has covered all aspects including Indian society's inherent fault lines. As long as some people feel alienated due to real or perceived injustices, or are easily influenced by money and other selfish goals, no nation can defend itself. There will always be a potential for internal disruptions. "If Judaism is incomplete without the Jewish homeland......."
It unconsciously reflects the strongly ambivalent attitude diaspora Jews have towards Israel in that they pray every day for deliverance to their land. If you pray to God for a bicycle and God gives you the bicycle - WHY do you go on praying to God for the bicycle? Jews do just this. Israel is 'the bicycle'. Secondly, Uniyal would do well, the world would do well, to see Israel as a island of enlightened resistance in a sea of unrelenting Islamic imperialism. This wonderful article about Israel's many accomplishments, brought tears in my eyes (it always does). Unfortunately, with what is going on in the Middle East, Europe and in the entire world, it is REALLY hard to be optimistic nowadays. Anti-semitism is on the rise and it IS NOT going away any time soon. Israel's many achievements and it's ability to strive in spite of the massive hate and hostility that surrounds it, IS EXACTLY what bothers its many enemies the most. But, as you mentioned, Israel has, at least, one new and great friend --- INDIA. I hope it will be a lasting friendship --- both countries will benefit from it. Thank so much Vijeta Uniyal for your kind words and thank you Gatestone. I would like to inform Ms. Hanna that India has always been Israel's friend. It was because of the majority community among the minorities that the nation had to remain seemingly indifferent to the plight of Israel. This community has not been very critical of India's friendship towards Israel. Indians have never targeted Jews though we have a very small population of Jews here. In Mumbai, they speak the local language. Such is the integration and so the affection for them. One of our family friends migrated to Israel but kept the contact for many years. In this global quagmire and increasing darkness, Israel remains the only beacon of light. Nestled between the vipers and hornets nests, despite the massive attacks and constant threats of annihilation, the Jewish State survives and thrives. It is living proof that if something doesn't kill you it does indeed make you stronger. Maybe we should stop for a moment and gather our senses and use plain common sense in our approach and treatment of Jews. What is most admirable about them is despite all that humanity has put them through during the many millenia, they're still the first to reach out and offer this same humanity a helping hand in the hour of need. Shalom, Israel.